This week we've added a new variety of Boar's Head brand cheese: Smoked Gruyere. With it's distinctive flavor, it is one of the finest cheeses used in cooking. Smoked Gruyere is great for preparing quiche, salads, pasta dishes, traditional cheese fondue, french onion soup, and of course, sandwiches. 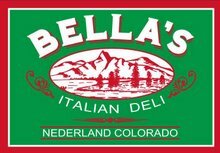 To browse more of the products you can find at Bella's visit the the virtual deli case at Boar's Head DigiCatessen. To stay updated on new products available at Bella's subscribe to this blog or send us an email at bellasdeli@gmail.com.